February | 2013 | Beer Apprentice - Craft Beer News, Reviews, Interviews and Info. Hi guys. Welcome back. For today’s craft beer review I’m going to be trying the Abbaye de Saint Bon-Chien (2007) produced by the Brasserie des Franches-Montagnes located in Saignelegier, Switzerland. I’m super excited about trying this beer. I had a 2008 Grand Cru several months back and I absolutely loved it. I have no reason to believe that this beer will not be spectacular. The website, brasseriebfm.ch, gave this mouthwatering description of the Abbaye de Saint Bon-Chien. L’Abbaye de Saint Bon-Chien, Strong sour ale, 11% vol. is a real UFO is a beer brewed in honor of the former brewery cat, sanctified when he disappeared. This vintage amber-red reflections is matured for several months in oak barrels having already contained wine or distilled spirits. These barrels will give complex aromas that beer. In the mouth, it recalls the plot of a fruity red wine with marked acidity. This bottle was #00276. Let’s pour. This brew came in a 25.4 oz. bottle and it had an ABV of 11.0%. It poured a deep ruby red to almost burgundy color. It was hazy with a light tan head. The crown was sized fairly well, quite smooth and even a bit creamy. The retention time was rather good considering the age of the beer. The lacing was thin, but it was nice and even around the snifter. I saw a thin skim of clear alcohol sticking to sides of the glass as I tilted it from side to side. On a side note… as I poured the second half of the bottle, the cap was a lot more fizzy and it seemed to dissipated more rapidly. The nose was…. PHENOMENAL!!! Extremely sour with wonderful fruits of tart black cherries, dark grapes and green apple. A slight vinegar waft was discovered and as it warmed I began to pick up notes of subtle funk and beautifully blended woody tones. Only a minor amount of booze was found. It kind of smelled like sherry. Very, very wine like in the bouquet. The complexity and balance of this thing was unbelievable. The taste was just as fascinating The sourness wasn’t as “puckering” as some of the other Sours I’ve tried in the past. It was relaxed, smooth, calm, harmonious and enjoyable. More relishes of dark grape and the black cherry flavoring seemed to punch a bit more. It was somewhat sweet in that regard. A slight vinegar savor and acidity was there, but an awesome woody finish combined with a minute funkiness helped polish and soothe the overall profile. Incredible…. just incredible in my opinion. The mouthfeel was medium bodied. Dry and snappy, but not quite as sharp as I had anticipated it being…. and that was a good thing. The carbonation was on the lower side and a little bit of warmth was felt after the swallow. An outstanding amount of flavor was left drenching the palate after each sip. It had one of the longest finishes that I’ve ever experienced. You know, this has to be one of the greatest brews that I’ve ever had and it totally reminds me of why I fell in love with craft beer. It was so complex, balanced and delightful. Every sip brought a smile to my face and each swallow uncovered little nuances that only added to the satisfaction of the session. The drinkability was superb as well. I could have killed this thing rather quickly, but I tried to take my time because I didn’t want it to end. 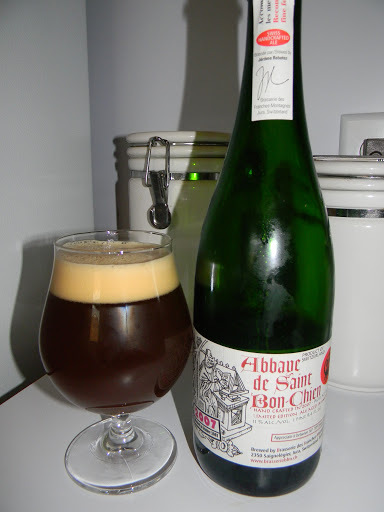 If you guys love Sours and ever have the opportunity to try an Abbaye de Saint Bon-Chien…. don’t pass it up. They are a touch expensive, but totally worth it in my opinion. I have no doubt that I will judge all Biere de Garde/Sours that I try by this one. I send my greatest thanks to Jerome Rebetez for creating this true work of art. Have you guys ever had one? What were your thoughts? I’d love to hear another opinion. Feel free to leave a comment if you’d like. Thanks for reading everyone. I appreciate it. Hey guys. What’s up? I hope all is well in your neck of the woods. Well, it’s about time for another craft beer review, so today I’m going to be trying the Surly Bender produced by the Surly Brewing Company located in Brooklyn Center, Minnesota.This will be my first time ever trying a Surly brew. I’ve heard and read a lot of great things about them, so it’s fairly obvious that I’m excited about trying the Bender. Let’s check the website, surlybrewing.com, and see what kind of info we can find. Here’s what happens when substance meets smooth. This oatmeal brown ale defies traditional categories. Bender begins crisp and lightly hoppy, complemented by the velvety sleekness oats deliver. Belgian and British malts usher in cascades of cocoa, coffee, caramel and hints of vanilla and cream. An easy-drinking ale with many layers of satisfaction. This beer came in a 16 oz. can and it had an ABV of 5.1%. It poured a very nice brown color with some burnt orange hues around the edges and the bottom of the nonic glass. The head was tan in color. It was also very soft, creamy and smooth. The size was not particularly large, but the retention time was solid and it left behind some very nice lacing as I sipped. The nose was pleasantly roasted. Hints of roasted coffee bean, toasted breads and toasted nuttiness. Primarily along the lines of hickory nuts and walnuts I thought. A nice combinations of earthy, leafy and floral tones added some complexity while a minor touch of chocolate and just a bit of toffee completed the well balanced and rather enjoyable aroma. The taste presented a more robust coffee aspect than did the fragrance. More of a discernible amount of chocolate was found as well. Flavors of burnt bread crusts, grains and a chalky nuttiness smoothed the bitter taste a bit from the chocolate, coffee and earthy hops. I detected a very light touch of caramel sweetness too. It wasn’t much, yet it was pronounced enough for a slight aspect. Like the nose, the taste was fairly well balanced and agreeable. The mouthfeel was medium bodied. Smooth, crisp, chewy and dry. The carbonation was of medium strength and a nice bit of flavor was left covering the tongue and roof of the mouth in between sips and for the duration of the drink. Overall, this is a very solid Brown Ale. It’s sturdy all the way around. 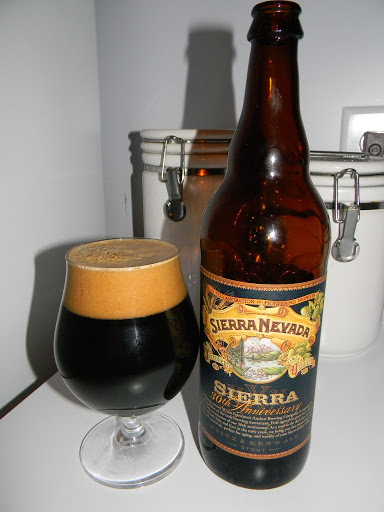 The drinkability was great and it would really suit the Fall or early Spring season to a “t”. The ABV is low enough to be able to enjoy a few of these during one sitting without too much trouble at all. I’d really like to try it again sometime. Actually, I just like to try another Surly brew period. 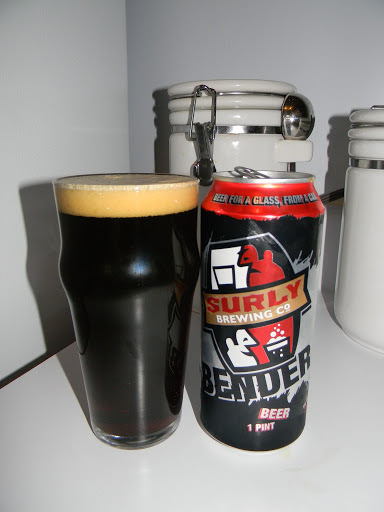 So, if you guys are lucky enough to have the Surly Bender distributed in your area, but you’ve yet to give it a try…. pick up a can and pour it on a cool afternoon. I think you may really enjoy it. I know I did.